"The Secret History - Our Own"
Nothing good on tv this Christmas? Here's something to fill 40 minutes! For I’ll mebbe see a christenin' yit afore I’m 95! Here's a recording of it from a Scottish folklife website; another by Will Fyffe, and a traditional English version from the British Library archives, recorded in Firle in Sussex (where Hilary's brother and family live). Hilary got me this DVD for Christmas - the trailer below is pretty good, but the full 80 minutes version is absolutely brilliant. The Bilyeu family of the Ozark Mountains (pronounced like "Blue") trace their origins to Ireland in the 1700s (let's face it, they MUST be of Ulster-Scots descent! There were folk called Blue who lived near our place when my da was a wee boy). Big Smith have been one of my favourite bands for years, introduced to me by my late friend Brian Richmond. Check Big Smith out here, and buy their new 16 track CD "Roots, Shoots and Wings". To make things even more confusing, apparently was even once a fish called the Portaferry Chicken! I googled it and sure enough it seems to have been a name for the sand smelt. This is the type of local knowledge that is still alive and well in rural communities across Ulster, has never been captured in academic textbooks or old historical volumes which were written by the smart folk, not the plain folk. A huge amount of the future task for Ulster-Scots is not just in the ivory towers of universities, or the all-too-often trivial fluff of entertainment and media. It's in giving a respectful voice, and encouraging a sense of value, within the quiet communities whose lives have always been far removed from either of those fake worlds - and whose hearts still beat with the real thing. I found this on Flickr a few weeks ago and was amused! "...Ulster continued to be the dangerous part of Ireland till after the war of the Revolution, when it was nearly colonized anew by the Scotch settlers and camp followers of King William's foreign forces. Eighty thousand small Scotch adventurers came in between 1690 and 1698 into different parts of Ireland, but chiefly into Ulster..."
I expect "small" doesn't refer to a race of pygmies, but 80,000 ordinary people with little or no money, who arrived here as refugees from famine in Scotland - the complete opposite of the 110 Plantation landlords who arrived here in 1610. I was up at BBC Broadcasting House last night, as one of the four panelists (along with Dan McGinn, Austin Hunter and Clare Hanna) for the pre-recorded "Seven Days" review of the decade. It's being broadcast on Sunday. Thanks to Robbie for the invitation, and to David Dunseith for chairing it so well! Sometimes called "Luther's Cradle Hymn", the world-famous "Away in a Manger" is one of the best known Christmas songs of Christ's birth. It was first published in Pennsylvania in 1885, but the tune that most people today know it by was written by William James Kirkpatrick, also in Philadelphia, around 1895. Some of the records of Kirkpatrick's family tree say that he was born in County Tyrone. I'll suggest that, as Ulster emigrants called Kirkpatrick who ended up as Methodists in Pennsylvania, it's highly likely that the family were Ulster-Scots. I must admit that I prefer the earlier tune, and I find the words a bit dubious in places, but Kirkpatrick's is definitely one of the best-known melodies in the world. Some of his other work is far superior. Regardless of your opinion of the tune, once again Ulster-Scots is proven to not be some narrow oddball identity (as its opponents try to present it) - but one which has made a major contribution to mainstream cultural life in the western world for centuries. Con O'Neill (15XX - 1618) - the first Ulsterman to be remembered on a gable wall? Con O'Neill, head of the Clandeboye O'Neills, is a fascinating character. He was the last of the great clan to own the massive areas of Upper Clandeboye, Lower Clandeboye and the Great Ards - which stretched from almost Ballymena to Killyleagh and included the whole of north Down and the Ards Peninsula. I was recently sent a superb article about his estate, and how it was sold off townland by townland. Con's lifetime saw the end of old medieval Anglo/Irish Ireland and the emergence of a new modern Ulster with Scotland at the centre of Ulster's development. A clear message of Con O'Neill's life is just how much co-operation there was in east Ulster between him and the lowland Scots, when he traded two thirds of his estate with the Scots Hugh Montgomery and James Hamilton. The legal documents of the sale of Con's estate are fascinating records, and prove beyond all doubt that the three men worked in close co-operation with each other. In particular, Montgomery and O'Neill had a close friendship. After all, it was Montgomery who sprung Con from Carrickfergus Castle, it was Montgomery who secured the Royal pardon for Con in London, and the two men travelled back to Ulster together via Edinburgh. On 24 December 1605 O'Neill and Montgomery signed "Articles of Agreement" with each other, within which "the parties covenant not to injure each other, but to aid and assist and defend each other and their tenants from wrong". They agreed to hold joint inquiries if any disagreements arose between their tenants, backed by a financial commitment of £1000 to each other, all written in the language of the Scottish laws of the time. During his latter years Con moved from his grand castle of Castle Reagh to Ballylenaghan / Knockbracken (around 1608), and then to the lower tip of the Ards Peninsula to the remote townland of Tullycarnan (around 1616). Con died around 1618, and was said to have been buried at the old church of Knockcolumbkille, which was situated in what is now Glenmachan or Garnerville in east Belfast. A while ago I found an 1800s drawing of what was claimed to be Con's gravestone, which at that time had been built into the gable wall of a local farm building. It's probably long-gone by now. But it's an ironic Ulsterism that he ended up on a Belfast gable wall! Con's old estate was in Antrim and Down - two of the counties which weren't included in the "official" Plantation - because by the time it got underway both counties already had a huge Scottish population. Of course you get the usual tiresome old story of "Planter and Gael", a stereotype narrative which seeks to pitch two peoples (incomers and natives) against each other, and which airbrushes away the uniqueness of the Scottish contribution to Ulster by lumping the Scots in with the English settlers. I suspect there's going to be a lot of that over the next few years, with the 400th anniversary of the beginning of the Plantation of Ulster in 2010. But we don't need to reinforce old selective myths and thereby fuel old hostilities. We need to return to the primary sources, the landscapes, the places, the buildings and the artefacts - and look afresh at them to find a newer, fuller, story to tell. 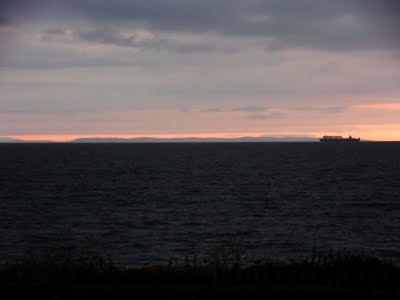 "...The Scots are a middle temper, between the English tender breeding and the Irish rude breeding, and are a great deal more likely to adventure to plant Ulster than the English..."
I took the family out last night for a bite to eat in Donaghadee. The bill came to £16.90. The studenty type young man at the till noticed my wry smile when he told me the total. "Interesting number!" I said to him. He looked at me blankly, with a puzzled expression. He had no idea of the number's significance. It made me wonder - if younger people these days don't even know the BIG dates in Ulster history, it shows how much work is required in explaining our lesser-known stories to today's generation. (New touch-screen iPod shown left) I have a few gadgets - my iPod is being used more now, the Blackberry is great, we have 3 computers in the house and my digital camera is a wee gem. Most of my tech is needed for the type of work I do, and as an Apple user, I take a bit of stick from people about my gadgetry. Most churches have by now invested a fair bit of money in technology - sound systems and of course the ubiquitous Powerpoint with projector and a variety of screens. But the new technology (far from making life easier) creates a whole new workload. How many man/woman hours are being spent worldwide every week in teaching people how to use the equipment, and in preparing church powerpoint presentations? It must be billions. Well, I have discovered something that makes Powerpoint obsolete. No longer is there any need to type in (or search the internet looking for) the words of this week's hymns and choruses - which are then copied-and-pasted into Powerpoint slides. 11) Different versions available, depending on your congregations denominational/theological emphasis. ...all of which dramatically reduces the weekly workload of this week's "worship leader", and might make a church service run more smoothly and less prone to embarrassing and disruptive tech failure. "When it's rainin' it's too wet to do it, and on a dry day I don't need it done". In the course of various things I've been reading recently, there's an emerging strain that connects some of the most influential early lowland Scots in Ulster right back to the Reformation, and in particular via Glasgow University. • Andrew Melville (photo of his statue in Stirling shown above, taken back in 2008) was John Knox's successor and a giant of his times, a Scot who spent time in France and Geneva as the Reformation soared. He "acquired European fame as an outstanding scholar in the literary world". By the time Melville reached the continent, John Calvin was dead, but Melville developed a close friendship with one of Calvin's closest associates, Theodore Beza. Andrew Melville came back to Scotland in 1574, becoming the Principal of Glasgow University. Melville blended his intellectual genius with spiritual leadership when he became the Moderator of the (Presbyterian) General Assembly in 1582. He famously humiliated King James VI by saying "Sirrah, ye are God's silly vassal; there are two kings and two kingdoms in Scotland: there is king James, the head of the commonwealth; and there is Christ Jesus, the king of the Church, whose subject James the Sixth is, and of whose kingdom he is not a king, not a lord, not a head, but a member." James never forgave him. • 1605: Two of Andrew Melville's students were the architects of the first big Ulster-Scots settlement: - two Ayrshire Scots, Sir James Fullerton and Sir James Hamilton were at the centre of the land-deal with Irish Gaelic chieftain Con O'Neill of Clandeboye. Fullerton had been a student of Melville's at Glasgow University (described in McCrie's Life of Andrew Melville as "one of his most intimate and steady friends") and Hamilton was believed to have been one of Melville's students at St Andrews. • Hamilton and Fullerton had arrived at Dublin in 1587 and set up a school. A few years later they were both made fellows of Trinity College Dublin where they influenced and educated the young James Ussher*, the future Archbishop of Armagh. It has been said of Ussher that "in his earlier life he held rigidly the opinions of Calvin" (reference here), no doubt passed down to him by Hamilton and Fullerton, both of whom had been trained by Andrew Melville. • 1606: Melville imprisoned / the settlement begins - By this stage King James VI of Scotland had become even more powerful, having also become King of England and Ireland in 1603. In 1606 he summoned Melville and some other Scottish ministers to London, where Melville vigourously protested against the King's ambitions to become head of the Church. Melville argued that a free General Assembly was essential - so the king had him arrested and imprisoned in the Tower of London for four years. It is hard to imagine the effect that the loss and vindictive persecution of a man like Melville would have had on Presbyterian Scotland. That same year the General Assembly had its first experience of what was described as 32 years of "kingly interference". 1606 was of course also the year that the aforementioned James Hamilton, and Hamilton's Ayrshire neighbour and rival Hugh Montgomery, began the large-scale permanent lowland Scots settlement of east Ulster. And as increasingly anti-Presbyterian laws were being regularly passed in Scotland in the early 1600s, the migration of Scots to Ulster grew stronger and stronger. A flow of young ministers followed the flow of people. • 1606 - 1623: Glasgow University after Melville: Melville never returned to Scotland (after being released from the Tower he was forced into exile in France for the rest of his life) but his intellectual and spiritual legacy lived on. He was succeeded at Glasgow University by Thomas Smeaton (who had been in Geneva with Melville in the 1570s) and later by Robert Boyd. Boyd appointed a young Ayrshire graduate called Robert Blair to be Regent of the University. Blair would later become renowned in Ulster-Scots history as the minister at Bangor and the effective leader of the Ulster-Scots. At Glasgow, Blair's students included a James Hamilton (future minister at Ballywalter) and John Livingstone (future minister at Killinchy). During Blair's time at the University, one of his professorial colleagues was David Dickson, who later became minister at Blair's home town of Irvine in Ayrshire, and who was involved in the famous revival at nearby Stewarton. At exactly the same time Blair, Hamilton (and later) Livingstone were at the centre of the simultaneous Ulster revival just across the North Channel, centred around Sixmilewater. • 1623 to the 1660s: The three young ministers and Glasgow graduates Blair, Hamilton and Livingstone became three of the most important figures in Ulster-Scots / Scots struggle of the Covenanters against the interference and opposition of the state against the will of the people - an experience which forged a Scottish migration into a solid Ulster-Scots community. All three stood against the increasingly tyrannical crown, all three were onboard Eagle Wing, after which all three returned to Scotland - where they played a central role in church and community life until their deaths. • Melvilles in Ulster: According to the Montgomery Manuscripts, Melvilles who were descended from Andrew's brother James began to arrive in County Down, from Fife, around 1610 - in fact, a Jane Melville married William Hamilton of Newcastle in the Ards Peninsula, a younger brother of Sir James Hamilton. 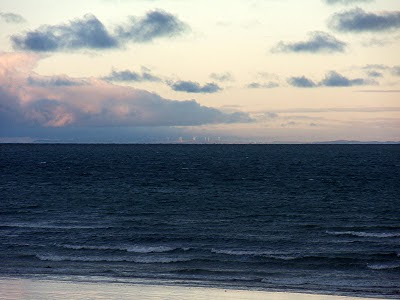 Perhaps these Melvilles were just following the path which their ancestor Andrew Melville had laid the foundations for. It's a joke grace of some sort - have you ever heard it before? They came from England's clime, less used danger and toil to face. Where Foyle and Lagan ebb and flow,- the pilgrims sate them down. They joyed that they were free to pray, with none to make afraid ! While Henry Colvert, Hubbard, Ridge did bear an English name. But though long dead, their work remains - their work will never die ! Sometimes the first isn't the most important. - The first permanent English settlement in America was founded in 1607 at Jamestown, yet the event which has the big annual festivities, Thanksgiving, marks the later arrival of the Pilgrim Fathers on the ship The Mayflower. - Here, many people look to Patrick and a variety of early "saints" as being the first ones to bring Christianity to Ireland. Maybe that is technically true... but perhaps the event which should be commemorated is the arrival of Brice, Blair, Cunningham et al in the early 1600s. Perhaps these were the men who brought the simple Reformed gospel to Ireland. This year, Edinburgh is hosting a number of Reformation-themed events during the New Year festivities of Hogmanay. I am fairly sure than John Knox would be appalled by this, but perhaps this might mark a turning point - one where the influence of the Reformation upon Scotland is being acknowledged in mainstream culture for the first time in many a generation. It was 1606 when the first obvious "kingly interference" struck the General Assembly of the Kirk in Scotland. It was May 1606 when the first large-scale migrations from Scotland to Ulster began. Maybe this should be our very own Thanksgiving. Wordia.com, the visual dictionary, are over here this week filming a series of videos about different people's definitions of particular words. As yesterday was St Andrew's Day, that's the theme for the week. Here are a couple of videos already online. As Ulster-Scots speech is fundamentally about vocabulary, I'd like to see what the Wordia guys could do with that as a subject - getting definitions of all of the classic words would not only be good fun, but also would be a great way for the older generation to pass on words to the younger web-savvy youth. So maybe technology can positively affirm regional identity, rather than erode it? A Psalter is a book of Psalms to be sung in churches, arranged in meter to suit particular tunes. Growing up in the gospel hall and mission hall world - where there was a fair bit of time spent speculating about the future rather than understanding the past - we didn't use a Psalter, we used the Believers Hymnbook on Sunday morning and Redemption Songs the rest of the time, both of which were full of centuries-old hymns, as well as other more recent ones from the late 1800s and early 1900s. However I was struck to discover that the 1650 edition of the Psalter remained as the standard until it was revised in 1929. When the 1650 edition was being prepared, the Church of Scotland appointed a group of six ministers to review the work. First on the list (recorded on p 288 of Treasury of the Scottish Covenant) is James Hamilton of Ballywalter, who at this time was ministering in Edinburgh. Also among the six were Robert Trail (whose brother William was a minister at Ballindrait in Donegal) and Hew McKail (whose father Matthew had been in Ulster in early 1644 - but I can't find my reference to this at the moment). The critics of Ulster-Scots usually focus on the Plantation of Ulster of 1610 and infer it was a one-way single event from which all of the subsequent ills of Ireland have grown, usually with the subtext of alleged invasion and dispossession of the native Irish. In the Plantation (in addition to other allocations to "servitors", the church and the London companies) 59 Scots were granted 81,000 acres / 51 Englishmen were granted 81,500 acres / 280 Irishmen were granted 94,000 acres. However, the reality is that there has been an ongoing two-way flow for (at least) four centuries between Scotland and Ulster. Even today, a quick spin down my Facebook friends list shows that a lot of people I went to school with ended up settling in Scotland. The 1650 Psalter is another example of this exchange, with clear Ulster fingerprints on its' production. A break from the usual subject matter. Do you have a brown bin? A while ago, our local council provided a brown bin for scrap food and organic waste like grass cuttings. They also gave us a wee small "caddy" bin for the kitchen that sits beside the sink, and when it's full it gets emptied into the brown bin (which is a mingin' job that none of our weans will do). The brown bin sits outside for two weeks between collections, festering away to the point where the stench would make you cowp (keel over). In the summer, the heat makes it ten times worse. The smell of ours was so bad the other day that I needed to (once again) bleach it and hose it out. Absolutely rank - I am convinced that the brown bin constitutes a health hazard and is indeed an evil scourge. The only answer for the nation is for everybody to buy half a dozen hens and feed your leftovers to them. Hen dung isn't that much of an aroma improvement, but at least you can put it on your strawberries and also get fresh eggs every day - and when the hens get past their lay-by date they save you a few £ at KFC. A wee jar of this stuff and away you go. I'm sure brown bins are great for the environment. As are the blue bins for cardboard and tins. As are the black bins for normal rubbish. And of course the various colour-co-ordinated bottle banks. My wife is a zealous recycler, and disapproves of my objections. My main worry (apart from the smell) is that in our household the rubbish is now better looked after than the stuff we want to keep! It goes to the tune of the Rowan Tree, but he thinks this is just the chorus part of a longer gospel song. If any of you know this, get in touch. During the 1920s and onward, recorded music started to make its way to Ireland. Old 78rpms were being recorded in the USA and were eventually turning up on this side of the Atlantic. From our own family collections, it seems that the early American recordings of Hillbilly Gospel music had the same impact on evangelical Ulster Scots homes. 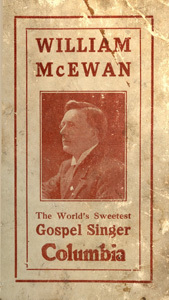 For example, my grandfather’s collection was full of Carter Family, Hank Williams, McCravy Brothers and Southern Gospel Quartets - as well as Scottish music and hymns by William McEwan. So it’s no surprise that if you were to listen to the hundreds of independently-produced Ulster gospel records of the 20th Century, you would hear echoes of Roy Acuff, the Carter Family and the Louvin Brothers, through the songs, the lyrics and the musical style. Hillbilly gospel music is essentially Scotch-Irish - no wonder people here love it! On Saturday night past Graeme and I were playing in Aughnacloy, County Tyrone. Also playing were other folk including the Pride of the Birches Accordion Band. The band are great, they play lovely sacred music and hymns in a sincere and non-showy style, and a lot of the members of the band are from a huge Murphy family! I took the opportunity to ask Alan and Joe Murphy if they had ever heard of The Murphy Gospel Group (old LP cover shown here). Sure enough, they told me that these Murphys were from around Lisburn and had a long career of playing hymns in wee churches and missions all around that part of the country in the 70s and 80s. Apparently the woman singer is still alive - hopefully still playing her mandolin! We have long-dead relatives who played mandolin and guitar in wee gospel trios in the mission halls of the Ards Peninsula in the 1930s and 1940s; when my father was renovating the old farmhouse (built about 1800, he worked to the Ralston/Johnston family who owned it when he was a wee boy, and he then bought it when I was 2, in 1974) he found hidden in the rafters an old autoharp case and a hexagonal concertina. The tradition is there, someone just needs to spend time recovering the pieces before it's all swept away in an X-Factor tidal wave. Given recent posts here at the 'Burn, you might be shocked that there is such a thing as a museum with a fair-to-middlin' Ulster Scots story. Well there is, and I have been to it. Here it is. The Settlers Museum of SouthWest Virginia was one of our stopping points on our honeymoon back in September 1997. (I first wrote about it in this article in Feb 2007) It's a converted farmhouse, tucked away in the southernmost corner of Virginia. In one room there, converted into an exhibition space, I learned more about myself and my ancestors than I have ever done in any museum or heritage centre in Northern Ireland. The staff were all volunteers, courteous and knowledgable. I remember an elderly lady called Dorothy who referred to "Northern Ireland" on the map there as "Ulster Scots Land". Sounded good to me! I think they've got a lot right. Community heritage makes so much more sense. As you know I've recently been drawing attention to the complete absence of any meaningful Ulster-Scots cultural history in Northern Ireland's institutions, whether in museums, education or the general media. Everything here is viewed through political glasses, and as a result cultural identity or history that doesn't neatly fit into the pre-determined political "two tribes" stereotypes gets suppressed, or scorned. (would it be too cynical of me to suggest that a lot of people have made careers and hefty incomes out of perpetuating "two tribes"? Flying round the world giving lectures on "conflict resolution" and "peace and reconciliation" must have its benefits...) So when I saw this large quote in an article in the Sunday Herald when I was in Dumfries, it caught my eye. Looks like the folk in Scotland are caught in a similar experience as we are ourselves. The article was entitled "The Secret History - Our Own", by Ian Bell. Try to find it online, it makes interesting reading. "...People are more interested in entertainment than sacrifice. Jacobites have good pub songs. Covenanters have hymns..."
FOOTNOTE: Back in 2006, when I was working on the Hamilton & Montgomery Settlement project, I had two sharp comments aimed at me. One was "you're just doing this to trump the Flight of the Earls in 2007", and another was "'Ayrshire to Ulster' doesn't have the same romantic appeal as 'Rathmullan to Rome'". My response to the first one was to laugh. My response to the second was "it really depends on your theological and cultural reference point". Just back from two very busy and enjoyable days in south west Scotland. After playing at Carryduff Presbyterian Church hall on Saturday evening (with the mighty Risin Stour and the Clan Davidson Highland Dancers) I headed for the last ferry, arrived in Stranraer about 1.30am, and drove through the night to the Station Hotel in Dumfries, getting there about 3.10am. The next morning I spoke at the annual Covenanter Memorial Service at St Michael's Kirk. I was invited by Jack Dodds, who spoke about their former minister William Veitch (a Covenanter who survived the carnage of Rullion Green in 1666), and I spoke about the general Ulster links and also about Rev James Hamilton of Ballywalter, who was minister of St Michaels from 1638 - 1648. I shared in a simple communion beside Veitch's grave, and then enjoyed lunch with Jack and his wife Avril. Also met some folk originally from Newtownards and Millisle who are members of the congregation, and another man who lives in Dumfries but is across in Northern Ireland regularly with his work. Drove up into Ayrshire past Irongray (where Ulster-born John Welsh was the minister), then to Alexander Peden's grave at Cumnock, before meeting up with Dane and Hazel Love at their home outside Auchinleck. Dane's hot-off-the-presses Covenanter Encyclopedia is excellent - get a copy! On Monday morning I spent time in the Carnegie Library in Ayr, and managed to locate the surviving tower of former Bangor minister Robert Blair's church in Ayr - and also a memorial to William Adair at the Auld Kirk (Adair was one of the four ministers who brought the Solemn League and Covenant to Ulster in 1644). An exahusting few days, but very worthwhile in pinning down yet more Ulster-Scots history, and in making connections with good people on the other side of the Sheugh. I love this stuff - a great book, superb online resources, magnificent design and rock-solid theology - all with an edge. Well, what did you make of the Covenanters programme on tv? You can watch it on iPlayer here. I thought it was visually superb, but in terms of storyline (dare I say, like the Ulster Museum...) there were a lot of big gaps. No mention of the two Margarets, of Richard Cameron, of the 18,000 martyrs, of Rullion Green, no images of the beautiful banners - of many of the big events that are in all of the best summaries of the Covenanters' story. I also thought that there were a few bizarre comments made, especially the closing remarks. Nevertheless, on Thursday morning, Radio Scotland will broadcast a 30 minute programme about Alexander Peden. Finally, I'm heading to Scotland this weekend, having been invited to speak at the annual Covenanters memorial service at St Michael's Kirk in Dumfries on Sunday morning. It's a special location, being the church that Rev James Hamilton of Ballywalter became minister of after his return on the ill-fated Eagle Wing. I'm going to spend 2 days in Scotland meeting people, visiting sites, and doing some photography. Will post a summary here when I get back. Thanks to all of you who have contacted me today about the short piece on the radio broadcast this morning about the lack of Ulster Scots historical content in the new Ulster Museum. I've had emails, phone calls and at an event this evening 7 people came to talk to me about it - three of whom were strangers but recognised me. It is interesting that you're all "normal people" (ie sensible middle-of-the-road folk who can't be glibly dismissed as Ulster Scots "activists" or "lobbyists") and you feel as disappointed as I do that your story has been left out. All of us thought that Northern Ireland had moved on from the old broken "two tribes" past. Sadly it seems that the heritage sector is lagging far behind the people! NOTE - Remember that "A History of Scotland" begins again on Sunday evening on BBC Scotland. For Northern Ireland viewers it's on the Sky digital channels away around 971. This Sunday night is "God's Chosen People" - the Covenanters! "...Belfast was founded by the English, but the Scotch element gaining the mastery, it became little more than a Scotch trading station in Ireland, the sole aim of the inhabitants being to make money and go back to Scotland again..."
These were men of what has been described as "the first Golden Age of historians of Belfast". When you add to the list men like Robert Magill Young, William Reeves, James O'Laverty, Classon Porter, W D Killen and Rev George Hill, you find that those great historians of 150 years ago were utterly convinced of the profound cultural and historic connections between Ulster and Scotland, and devoted large portions of their lives to researching and publishing these connections. It is a shame that so many of today's professional historians and educators in Northern Ireland have made it their business to ignore their predecessors' monumental achievements and seek to airbrush Scotland out of our story; in doing so they perpetuate the failed and divisive political "two tribes" narrative, and hide from us our full cultural heritage. I was interviewed this evening, it might be broadcast on Good Morning Ulster some time soon. BBC NI phoned me this afternoon, having seen the blog post below about the Ulster Museum. So, once again, I end up on the radio unintentionally. Just hope it comes across sensibly - there's a huge Scottish dimension to the heritage of Ulster that is being ignored by not just the Ulster Museum, but by almost the entire heritage sector. It's funny that this blog has such a wide reach! On a more constructive note, thanks to everyone who has been so positive about the Covenanters in Ulster programme which was broadcast on Sunday. You can still listen to it on BBC iPlayer by clicking here. In his excellent book Intimate Strangers - Political and Cultural Interaction between Ulster and Scotland in Modern Times - Graham Walker begins by quoting ATQ Stewart: "At the core of the Ulster problem is the problem of the Scots". The new Ulster Museum exhibition galleries and interpretation clearly have a problem with the Scots. Example One is the Ulster Tartan. As you know from previous posts, I'm not really into tartan. But it is a solidly Scottish cultural phenomenon. And as this article by Matthew Newsome FSA Scot says, "... The only Irish district tartan that is truly historic is the Ulster tartan...". In the Ulster Journal of Archaeology, 1961/62, there's a 23 page academic paper about the Ulster tartan. It was discovered, preserved intact, in 1956 near Dungiven. It was peat-stained and discoloured but was taken to (guess where) the Ulster Museum for examination. A textile specialist, Audrey Henshall, carried out a detailed examination and even produced samples of the original colours - a vibrant green and red with fine details in black and yellow. The clothing was displayed at the Ulster Museum in 1958 as part of the big Elizabethan Ulster exhibition. It was an Ulster icon and graced the catwalks of swinging sixties London. Then in the early 1970s the Scottish Tartan Authority acknowledged its importance and authenticity by registering it as Ulster Tartan. The reconstruction is based on the remains of clothing (in front) that was found in 1958 one mile north of Dungiven, County Londonderry. The find included a cloak, coat, trews and shoes of the sort that would have been worn by a male member of a Gaelic Irish family in the first half of the seventeenth century. - No mention of tartan. - No mention of Scotland. - No mention of the early 1600s Ulster-Scots settlements of County Down or the tartan industry that sprang up near Newtownards. - The only cultural reference is "Gaelic Irish". 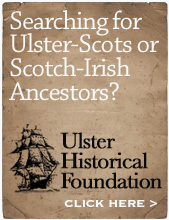 With an artefact with such an obvious, non-contentious, credible and already thoroughly researched Ulster-Scots story to tell, the Ulster Museum has chosen to apply cultural exclusion, and you might argue cultural displacement, asserting a "Gaelic Irish" cultural connection and removing the solidly Ulster Scots. INTRO: When I was at Regent House (1983 - 1990), one of the few things that stick in my mind was when I spotted an error in the history text book. It had the wrong date for the burning of Ridley and Latimer - I had consulted some of my da's old Victorian books about the Reformation to check. My teacher, Mrs Groves, wrote to the publishers, who wrote back and conceded that I was right - and that the next edition of their book would have the date corrected. For a while Mrs Groves had the letter pinned up beside her desk on the classroom wall. I was about 14 at the time, and it was a big lesson learned. Textbooks can be wrong. Two types of people spread this stuff - 1) those who are either opposed to, or uncomfortable with, Protestants being in Ireland in the first place, or 2) by those who have believed the false spin and who, as a result, are either uninformed, or feel guilty about, the Plantation. The arrival of the Protestant settlers here is often stupidly (or cynically) presented as a kind of social paradise - an idyllic existence where the native Catholic Irish were subjugated and the Prods lived happily ever after as oppressors and land thieves. It's divisive and false. A Plantation Paradise? Maybe for a handful of wealthy individuals in the gentry who were top of the pile - but absolutely not for the 99.9% of the common people. "Mined in Scotland, Forged in Ulster, Exported Worldwide" was a phrase I devised about 10 years ago, and which the then Ulster Scots Heritage Council adopted as their slogan. It was the intense white-hot furnace of the Ulster experience that forged the history, character and identity of the Ulster-Scots - not some false utopia. I went to the much-heralded new £17m Ulster Museum this morning. I spent about 2 hours browsing the displays and reading the interpretation. I know that there have been architectural concerns, there have been objections to its new closed-on-a-Monday policy, and bemusement that it downplays the thing that Northern Ireland is (unfortunately) world famous for. But of FAR bigger concern to me is the Ulster-Scots component. Why? Because there isn't one. This cannot be an accident. Museum people spend a lot of time, and money, considering what artefacts to show and how to display and interpret them. Therefore, there has been a purposeful decision to exclude a meaningful Ulster-Scots dimension from the new Ulster Museum. For all of the 21st century interior design and graphic design (both of which are excellent), I'm very disappointed to say that the Ulster Museum can be added to the list of those institutions still trapped in a medieval Anglo/Irish mindset. I am working on a personal analysis of what I saw there today. I will cite a number of quite shocking examples later in the week - which you can go and see for yourself. Meanwhile, the special edition of Radio Ulster's Kist O Words, about The Covenanters In Ulster, with myself and Dr William Roulston, is broadcast tomorrow at 4pm. The foundation of any language is of course individual words. Nearly everyone in Northern Ireland (apart from the self-conscious-and-upwardly-mobile) says "aye" instead of "yes" and "wee" instead of "little". That's evidence of just how big the impact of Scots has been here over the centuries. Hardly anybody in Northern Ireland nowadays knows who James Orr, the Bard of Ballycarry, is - never mind go to the linguistic depths of memorising his poetry. Outside of east Londonderry, Antrim and Down, maybe not many folk even use the obscure words that my mother uses. But it would be great if more people, young and old, came to recognise just how many Scots / Ulster-Scots words they naturally use every day. Found this online today - enormous downloadable JPEGs of what I consider to be the most beautiful map of County Down I've ever seen. Small cropped section below; click to view it at full size. Townlands are marked on it, and which are of course usually old Irish names. Some people point to this as evidence that the arriving Scots settlers of the 1600s had little or no impact on the landscape of Ulster. This is of course nonsense, because whilst the Scots were happy to use existing townland names, they also introduced endless amounts of what might be called sub-townland names all over Ulster which are clearly of Scottish origin. Here's a personal example - I live in the townland of Ballyhemlin, but the specific area I live in is called Clydesburn (hence the name for this blog). Williamson's map of County Down is available to download here, in four sections. Be warned - each JPEG is around 300mb when opened! If you tune in at 4.00pm this Sunday you'll be able to hear the special edition of A Kist o Wurds about the Covenanters in Ulster. Here's a summary of the programme with some pics of us all at the various locations. New Alexander Peden (Covenanter) book - just £6.99! I'll be advertising a few Covenanter related things over the next week or so. First up is the new 108 page book "Some Remarkable Passages of the Life and Death of Alexander Peden, Prophet and Covenanter, in Scotland and Ulster". It's a reprint of a 1755 Belfast edition, and has a new Foreword, Biography, selection of Historical Poems, an article entitled "The Unforetold Legacy" and an article entitled "Publishing Peden". 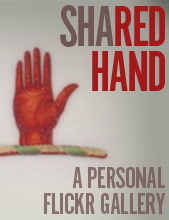 It contains 26 photographs and illustrations. Put this on your Christmas list! It's hot off the presses - copies are already available here from the Ulster-Scots Language Society - you can either buy online or from their premises. Alternatively, phone Derek on 028 9043 6716. A big thank you to everyone who helped so willingly in its production - Jack, William, Glen, Alastair, Dane, Derek and the folk at the Ullans Press. (It's mostly in English, with just the historical poems and one quotation in light Scots). Click the photos to enlarge. 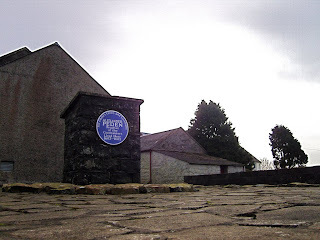 Alexander Peden - the man whose prophecies enthralled the rebels of 1798, who lived the life of a fugitive on the Glenwhirry moors, and whose memory is perpetuated by a faithful band of Covenanters who still gather at the Mistyburn in his memory. In the era of the “chapmen”, the door-to-door pedlars who sold cheap and popular literature, Alexander Peden fascinated readers in Scotland, Ulster and America for centuries after his death. This reprint of the 1755 Belfast edition contains many stories of Peden’s life in Ulster, and gives Peden his rightful place as one of the most important figures in Ulster-Scots history. • GOD'S CHOSEN PEOPLE: The episode looks at the Scottish Covenanters, and how they redefined their own place in Britain, and Britain itself. The programme claims they sparked the revolution that struck off the head of Charles I and ultimately led to Cromwell's conquest of Scotland to defeat the Stewarts. • LET'S PRETEND: Covering the time from the wake of the 1688 revolution that brought William of Orange to power, through to Culloden, the episode looks at the Darien project and the 1707 Union of Parliaments. • THE PRICE OF PROGRESS: Focusing on the years between 1754 and 1783, the programme looks at the riches Scotland made from transatlantic trade, but questions the moral cost. The episode also claims that the phrase from the American Declaration of Independence, "life, liberty and the pursuit of happiness", was coined by John Witherspoon, a minister originally from Paisley. It also relates the story of Joseph Knight, a slave brought to Scotland from Jamaica, who challenged – and defeated – his owner in court. • THIS LAND IS OUR LAND: The episode examines the conflicts between those who owned Scotland and those who lived in it during the 19th century. It focuses on Sir Walter Scott, and the way his romantic image of Scotland emanated from his fear that revolutionaries in industrial towns would sweep away everything distinctively Scottish. • PROJECT SCOTLAND: Examining how Scotland went from a pre-war industrial powerhouse to post-war marginalisation in the space of a generation, the episode will look at the mass exodus of Scots in the 1920s and 1930s. It goes on to revisit the work carried out by the Scottish Office in the 1950s and 1960s to reinvigorate the nation, followed by the impact of Lady Thatcher and the path to devolution. I heard a true story this morning. Donkeys years ago, a stranger arrived in Ballyhalbert to find a long-lost relative. At this point Ballyhalbert was still a two street village. The stranger stopped a local, and explained that they weren't able to find the address they'd been given. "Ye're loast in Bellyhelbert?... A doot ye'd be as weel jist stayin' at hame." I had an enjoyable and interesting meeting today with a Queens University academic about Ulster-Scots related issues, with particular relevance to community relations in Northern Ireland. We talked for the best part of 2 hours - I hope he got something out of it. What became ever more clear to me during the conversation is that the "two tribes" stereotype of Northern Ireland - Protestant/Catholic British/Irish Unionist/Nationalist - is not the whole story, but its' perpetuation is doing huge damage to our cultural life. To me, this outmoded bipolar model harks back to the 1500s, when the issues on this island were English/Irish. To be stuck in this mindset 500 years later is a tragedy and disgrace. Why? Because it leaves out Scotland. In the 1600s Ulster was changed forever when a tidal wave of Lowland Scots began to arrive here. We might have a "two tribes" political identity, but we have three-sided cultural identity - with Scotland the missing piece. The distinctive regional flavour of Ulster compared to the rest of the island is overwhelmingly due to the influence of lowland Scotland. But the Scottish chapter of Ulster's story is, for most people who live here, completely unknown. And its potential is unrealised. As long as society, politics, academia and the media remains stuck in the false, 1500s, two tribes mentality, and as long as political identity continues to be imposed upon cultural identity, a"shared and better future" will remain just a buzzphrase for government policy. It's time to change the story. 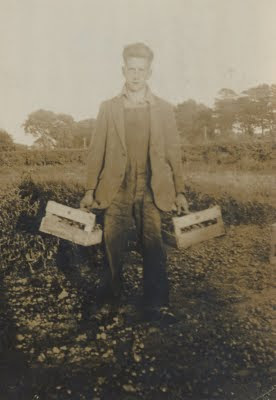 This is a photo of my granda as a young man, hokin' prootas or gathering potatoes. He lived at Ballyrawer outside Carrowdore on the Ards Peninsula and when he married (on 10 January 1938) they later moved to Islandhill (a place Wilbert Magill calls Blacktoon) and bought a wee house there in April 1940. He died when I was just 10 and I have only very faint memories of him, and his garden that he spent so much of his time in. I can remember one day he showed me how to pull out nettles by the roots without getting stung. I love this photograph. The wee house was (literally) a pighoose when he bought it. It had just two rooms, and in later life he bought a block-making machine. The weans then helped him to make concrete blocks, and with these he built "the far room", an extra room on the end of the house. The floor was earthen, where the weans played "pugs" with marbles and wee holes they hoked in the floor. To add a bit of grandeur, he worked for weeks to make a mosaic doorstep with a star in it. (And no, he was neither Orangeman nor Mason). Even to this day, the water tank is on the roof outside - and the roof itself is corrugated iron. The second photograph is of his wife, my granny, Mary-Ann (Molly) Hamill. 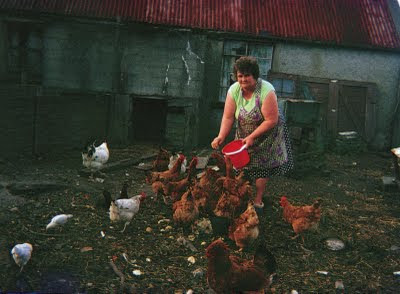 This is her as I remember her, feeding the hens at the back of their wee house. She died about 6 weeks after my granda. She'd married him when she was just 19 (he was 32) and I imagine just couldn't bear to live without him. They raised 9 weans in that wee house - a far simpler, harder life than any of our pampered, spoilt generation will ever know. The gowden gates o’ Heaven, an’ ma ain countrie. That we a’ micht gang wi’ glaidness tae wor ain countrie. Over the years there's been a fair bit of comment about Ulster-Scots being "too Orange", or indeed of Orangeism being affected by the emergence of Ulster-Scots (funding). There are both overlaps and distinctions between these two cultural traditions, and major discussions could be had about these issues, but not on this post. But never mind oranges, what about apples?! • Denis Campbell was appointed as Bishop of Derry, Raphoe and Clogher in 1604, but he died in London in July 1604 before he took up his post. • Shortly after, the same bishoprick was given to George Montgomery, Sir Hugh Montgomery's younger brother. Montgomery arrived in west Ulster around Spring 1607 and began to bring lowland Scots from Ayr, Glasgow and Irvine into Derry, Donegal and Killybegs. His portrait is in Clogher Cathedral. • In 1610 Montgomery's bishoprick was changed, with Raphoe being replaced by Meath. His job at Raphoe was filled later that year by yet another Scot - Andrew Knox. He was related to the famous John Knox (possibly a nephew?) and therefore also related to Josias Welsh. • When Montgomery died in 1620 his position at Clogher was taken up by another Scot, James Spottiswood, brother of John Spottiswood, the archbishop of St Andrews. ...anyway, Echlin set up home at Ardquin (between Portaferry and Kircubbin - it is said he chose the location because it reminded him of the landscape of Fife) and built an Abbacy there beside the old church. The church has recently been refurbished and the Abbacy ruins have a house built inside them - quite a remarkable thing to see! Echlin died in 1635 and was buried at Ballyphilip in Portaferry, an old graveyard that's now very badly overgrown and locked up most of the time. When Echlin died, he was succeeded as Bishop of Down and Connor by yet another Scot, Henry Leslie. "...the tree is vigourous and has decorative blossom. It is a cooker or sauce apple. It was popular with the victorians and widely grown in gardens also recommended for an 'artistic' orchard. It was popular in Worcestershire. No longer planted by 1930s, as fruit bruised easily..."
"...The honourable Elizabeth Montgomery died ye 15th of November anno domini Christi 1677 aged 42 years. William Montgomery of Rosemount Esq her only husband continued a widower and so died on ye 7th day of January anno domini 1706 being 74 years old. Hugh first Lord Viscount Montgomery of Ye Great Ardes by his two eldest sons was grandfather of them whose earthly remains are layd in ye vaulted tomb before his Manx marble both of which were made for their peculiar repository by ye care pains and cost of ye said wina due defence ten years Elizabeth his good and only wife their only issue James in August 1687 married Elizabeth eldest daughter of Archibald Edmonstone Laird of Duntreath..."
A clip from Bangor Abbey last night. No amplification or effects - the raw performance. Full post over at our Thompson Brothers blog. More clips to be uploaded over the next few days. ...that Countrie of Ireland requireth rather lasting and warm clothes than gorgeous and deere garmentes..."
Pass that on to your wives, gentlemen! Last Saturday, Dr William Roulston and I spent most of the day with Laura Spence of BBC Northern Ireland, and Elizabeth Rice and David Walker of Blackthorn Productions. We recorded a special edition of Radio Ulster's "A Kist o Wurds" about the Covenanters in Ulster - it will be broadcast in three weeks' time at 4pm on Sunday 1st November and repeated at 7.30pm on Wednesday 4th November. It comes hot on the heels of an edition of Kist where Laura, Elizabeth and I did a lengthy but fairly informal piece about Newtownards Priory, and a shorter piece about very rare edition of the Montgomery Manuscripts, which had been discovered by my old friend Jim Tollerton of Stacks Bookshop in Dundonald. That programme was broadcast on 20 September, and I had lots of positive comments about from folk who heard it. • BBC Radio Scotland have also recently made a programme about the Covenanter "prophet" Alexander Peden which will be broadcast over the coming weeks too. I understand it will be presented by Richard Holloway, Chair of the Scottish Arts Council. He presented the tv series "The Sword and the Cross" a few years ago which also touched on the Covenanters. • I'm told that BBC Scotland television have also completed an hour-long episode of their mega series A History of Scotland about the Covenanters. The first five episodes in the series dealt with ancient and medieval Scotland and were originally broadcast this time last year (they've recently been repeated on BBC Four). The second five episodes begin in the late 1500s and will be broadcast starting on 8th November, with the last of the original five programmes, "Project Britain" currently viewable online on BBC iPlayer. The series is presented by Neil Oliver. The Covenanters' story deserves a wider Ulster stage than just 30 minutes on radio - and sadly I expect that the BBC Scotland programmes will reduce Ulster to a footnote - but hopefully the programme will be a first step to something bigger. With thanks to everyone for the enormous graft that's gone into making the programme happen.